North America Microwave Oven Market is expected to garner $7.9 billion by 2020, registering a CAGR of 5.1% during the forecast period 2015-2020. Microwave ovens have become an essential part of the kitchen, be it for re-heating the food or preparing daily meals. These ovens function on thermal energy by heating the polar molecules in food, a process also known as dielectric heating. The microwave radiations emitted from microwave oven are of shorter wavelength, but they possess enormous amount of energy which facilitates faster cooking. Microwaves, depending on their power output, can alternatively be used for roasting, baking, and grilling. The North America microwave oven market is expected to grow at a moderate pace during the forecast period, with a CAGR of 5.1% over 2015-2020. U.S. is the largest market of microwave ovens in North America, followed by Canada. The market in the region is witnessing demand for premium range and in-built microwave ovens, driven by the growing popularity of modular kitchen designs and increasing purchasing power of the consumers. The market is segmented on the basis of product type into: convection, grill, and solo microwave ovens. Convection microwave oven would be the highest revenue generating segment across all the years as it offers several cooking functions and enables uniform cooking. Based on the structure, the market is bifurcated into built-in and countertop microwave ovens. The countertop microwave oven segment is the major revenue-generating segment due to the easy portability and lower prices of these ovens. However, the built-in microwave ovens are likely to achieve robust growth during the analysis period. 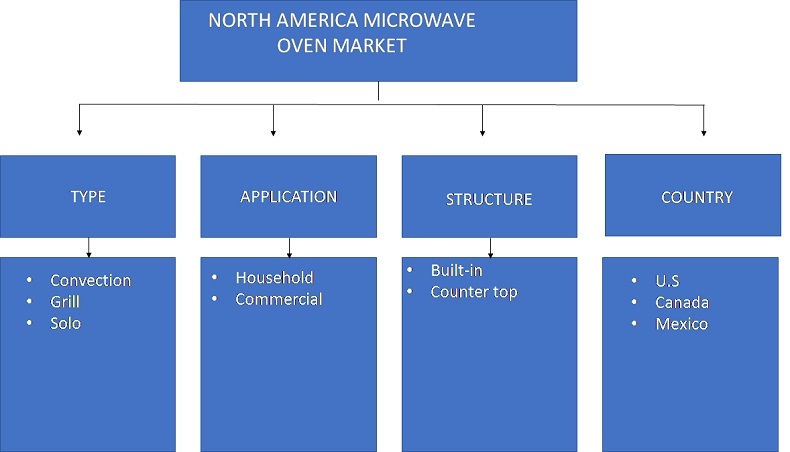 The North America microwave oven market is also analyzed with respect to the household and commercial application of microwave ovens in the region. The report provides an in-depth analysis of the North America microwave oven market in countries namely the U.S., Canada and Mexico. In 2014, the U.S. generated the largest revenue in this North America microwave oven market. However, Mexico is likely to witness robust growth during the forecast period, owing to improving living standards and demand for efficient microwave ovens, which enable fast cooking. The rising propensity of consumers to spend on appliances, which assist them in kitchen chores, is generating an increasing demand for microwave ovens. The key players profiled in the report include LG Electronics, Samsung Electronics, Alto-Shaam Inc., AB Electrolux, Sharp Corporation, and Hoover Limited among others. Porters Five Forces model and a SWOT analysis of the industry illustrate the potency of the buyers and suppliers. A quantitative analysis of the current market scenario and future estimations from 2015 to 2020 is provided to showcase the financial competency of the market. The report presents a detailed analysis of the North America microwave oven market with respect to type of microwave oven, types of application, product structure, and countries to enable stakeholders take precise investment decisions. 8.1.4 SWOT analysis and strategic conclusion of LG Electronics Inc.
8.2.4 SWOT analysis and strategic conclusion of Samsung Electronics Co., Ltd.
8.3.3 SWOT analysis and strategic conclusion of Alto-Shaam, Inc.
8.7.4 SWOT analysis of Illinois Tool Works Inc. FIG. 38 SWOT ANALYSIS OF ALTO-SHAAM, INC. FIG. 50 SWOT ANALYSIS OF ILLINOIS TOOL WORKS, INC. The microwave oven market in North America, comprising the U.S., Canada, and Mexico, is expected to exhibit a constant growth over the forecast period. The conventional microwave oven market penetration in the U.S households is at its peak, however consumers are opting for premium range and built in microwave ovens, while remodeling their homes for enhancing the overall look of their kitchen. Growing health concerns and rising rate of obesity among consumers, has led to growing demand for low-fat and homemade food over packaged microwavable food, which has encouraged market players to launch new and innovative microwave ovens which offer healthy cooking by using minimum oil. The market is expected to witness growing demand for premium range microwave ovens, because of increased propensity of consumers to spend on high-end advanced kitchen appliances. Consumers are opting for multi-featured microwave ovens with innovative technology, which help them to cook food conveniently with minimum manual labor. Built-in microwave ovens are preferred by consumers to save space and enhance the aesthetic look of the kitchen. Well-established market players are launching innovative microwave ovens to cater to the demand of consumers. For instance, in February 2016, GE in partnership with Local Motors Inc. developed a new oven which enables consumers to make restaurant-style pizza at home conveniently. In addition, with the help of a mobile application, some features of the microwave oven can be operated via a smartphone. Within North America, the microwave oven market is expected to witness the highest growth in Mexico on account of the increasing demand for microwave ovens in the coming years. "North America Microwave Oven Market"